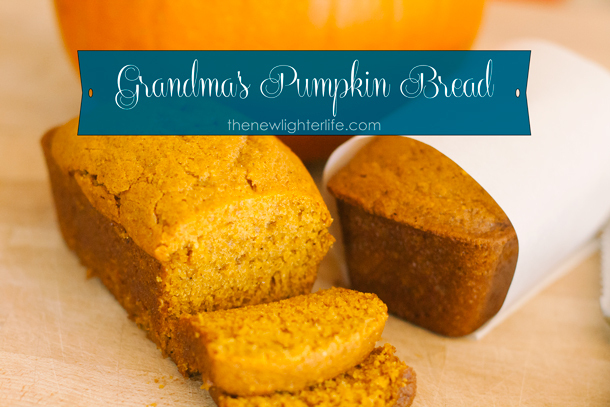 Nothing says fall like Grandma’s Pumpkin Bread! But before I get to that I have to tell you, I almost lost it a few days ago. My fellow RVing friend, Alicia, told me that baking in the RV oven was challenging and boy was she RIGHT! After attempting a coffee cake (that was crispy on the bottom and gooey in the middle, I had my moment of temporary insanity. I had followed all the advice I could find online about RV ovens (which I’ll cover in another post) – still my cake was yuck-o! Hello Pinterest! Oh how I love thee! Who knew such a thing was possible, so I gave it a shot with some of that pumpkin I dealt with the other day. I did a little controlled experiment and made a few adjustments to my RV oven setup. My goal was to show the impossibility of baking in RV ovens and the success of the crockpot. But my adjustments to the oven worked!! Ha! So if you’re struggling with your oven, head over here for my tips. They both tasted great but the crockpot version was a little more moist and flatter on top. My family was still cool with it. 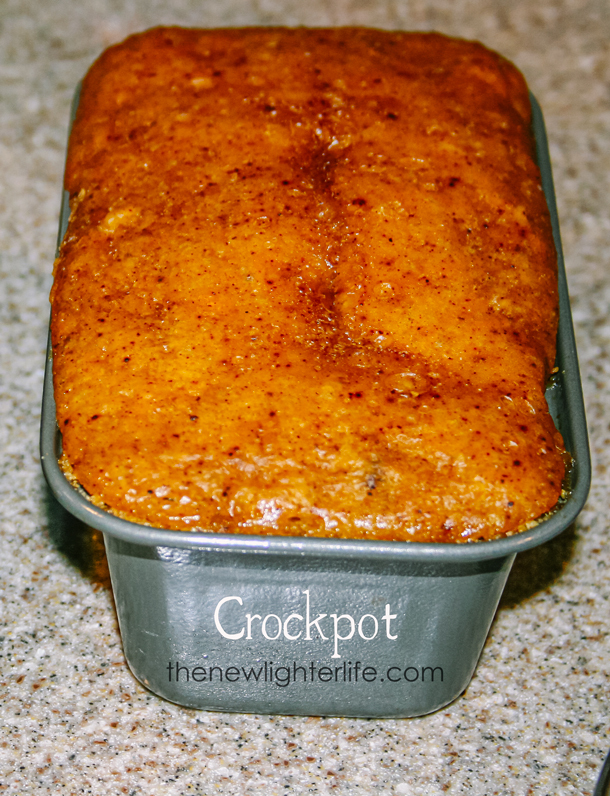 I found instructions for crockpot bread, here and used my all-time favorite Grandma’s Pumpkin Bread recipe. One thing I do like about the crockpot one, it’s not so time sensitive. Meaning, I can leave it and go do laundry without worrying about it burning. I’m not the greatest about setting the timer anyway so I like the flexibility the crockpot offers. So we have a win-win here folks! Now you have to try my pumpkin bread recipe… it is super-delicious!! Pour pumpkin bread batter into your greased loaf pan(s). Bake at 350 degrees for 1 hour for a standard loaf or 20 to 25 minutes for 3 mini loaves. Pour a couple of cups of water into the bottom of your crockpot, you don’t want the water in the crockpot to go into the bread pan once you place it in there. Pour your pumpkin bread batter into your greased loaf pan(s). Place the filled pan(s) into the crockpot. Lay several paper towels inside the crockpot, so they just rest on the top, and cover towels with crockpot lid to hold them in place. This is done to collect the condensation that will inevitable form from the water sitting at the bottom of your crockpot. Bake for 2 to 3 hours, check bread’s doneness with a toothpick or knife. Thank you, thank you, thank you!! I don’t know why I didn’t think of searching for how to do quick breads in the crock pot! We can’t use our RV stove/oven because I’m so sick that the propane makes me very ill, so we’ve been trying to work around baking since May. You are very welcome Christa! I hadn’t known it was possible until very recently either. My friend, Alicia, got a toaster oven that she put in place of her microwave. Is that an option for you? Or I thought about doing a convection/microwave combo. I think Wal-Mart has them for about $250…not cheap…but when you’re talking about baking cookies, it may just be worth it. I am finding out that the crockpot is way more useful in the camper. I’ve always cooked my applesauce on the stovetop but today made it in the crockpot instead. Easy peasy! Any chance you’re missing some ingredients in your recipe–flour? Ack!!! You bet I am! It needs 1 2/3 cup flour. I’ll update the recipe.